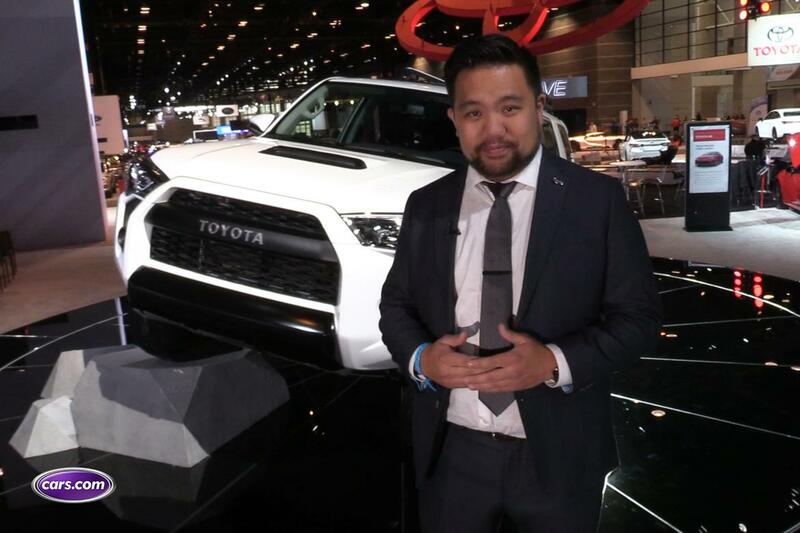 At the 2018 Chicago Auto Show, Toyota has given slight changes to its lineup of three TRD Pro vehicles. Those vehicles are the Tundra, the Tacoma and this, which we'll focus on here, the 4Runner. Cosmetically, there's not a lot different for 2019 with the 4Runner TRD Pro. It has a new standard roof rack, which is a bit of a callback to the FJ Cruiser, and Toyota's new color for 2019 is actually Voodoo Blue — another shout-out to the FJ, which wore that color back around 2009 or so. The real exciting changes for the 4Runner TRD Pro actually happen in the wheel wells. The 2018 model rode on Bilstein shocks; this year, the 4Runner has Fox shocks, which were equipped on the 2018 Tacoma TRD Pro and are standard now across all three models. The big difference between these shocks is that the Fox shocks have an internal bypass system. What that means is that it can change how it reacts in certain situations: On the road under medium load, the shock can remain soft and pliant. If the shock rebounds or compresses a lot, it can change the pressure and keep the suspension from bottoming out and not rebounding too hard if you drive over a "whoop" off-road. The 4Runner has always been my favorite of the three TRD Pro vehicles, but if you opt for one now, there's a huge caveat: Both the Tacoma and the Tundra offer Toyota Safety Sense P standard. That's a suite of safety technologies that includes adaptive cruise control, lane keep assist and autonomous forward emergency braking. Those technologies aren't available on any trim level of the 4Runner, so if you do opt for the 4Runner, you'll have to forgo those safety features. We did ask Toyota when they could potentially be coming to the 4Runner, but they were noncommittal. No pricing information is available yet on the 2019 Toyota 4Runner TRD Pro, but further details will come out closer to its on-sale date in the fall of 2018.